Serious balm for seriously beautiful skin. Samba face balm is the overnight treatment that repairs skin while you sleep. Counteracts the effects of pollution, stress, travel-fatigue, harsh weather, and fluorescent light. Samba’s green colour reflects its botanical and organic origins but it does NOT make your face green! Glides on for an extra glow while its powerful yet gentle ingredients do the heavy-lifting of skin restoration. Notes from Wendy’s Formulation Diary…. Samba's green colour reflects its botanical and organic origins but it does NOT make your face green! Glides on for an extra glow while its powerful yet gentle ingredients do the heavy-lifting of skin restoration. Samba. Sensual and silky night repair balm with texture of moonlit kisses. A sensory feast for body, mind and soul. Drift off and dream of tropical islands where you dance barefoot in the shallows or swim with wild dolphins. Tantalizing berries and seeds energise and nourish with their antioxidant goodness. Awaken with nourished, dewy soft skin. Reiki and gemstone infused to activate your body's inner healing energies. Apply small pea-sized dab and allow to melt into your skin. Free from preservatives, gluten and palm-oil. Samba is part of the GlowSensualSystemTM that combines mega doses of luxury ingredients infused with ancient alchemical and healing energy to make your skin succulent and your spirit soar! Samba is potent. One pea-sized dab is enough. Allow to melt into your skin with gentle fingertips. To enhance Qi even further, tap gently over your face using raindrop or piano fingers. For best results, use with Drench collagen-building facial spray and Jardin de Fleurs cleanser. Should Samba melt in transit, it remains safe to use. Store cool and allow to reset. Store cool, dark and DRY, replacing lid immediately after use. 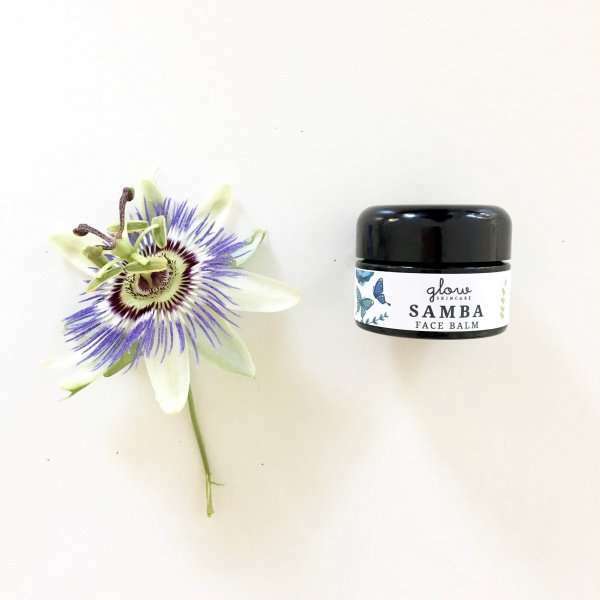 Samba face balm has been designed for your face, neck and décolleté. It is suitable for lips and cuticles too and can also be used as a weekly superfood face mask. Simply apply a thciker layer and allow to absorb for 30 minutes. Wipe any excess ontot he backs of your hands. For daily use, a quarter of a pea sized dab is enough. Use clean and dry fingers to remove from the jar. A spatula or teaspoon handle is even better. * Mix a small blob with a dab of Radiance or Jardin de Fleurs, as a cleanser/makeup remover. * Use Samba as a protective and nourishing treatment when weather is cold, dry, windy, snowy or when travelling by plane. * Use as a preparation for facial massage or Gua Sha. * And of course, as the smoochiest lip balm ever. Mmmwhah. This face balm is amazing! I only have to use the smallest amount and the balm feels so light on the face and lips, but the effects seem to last and last. 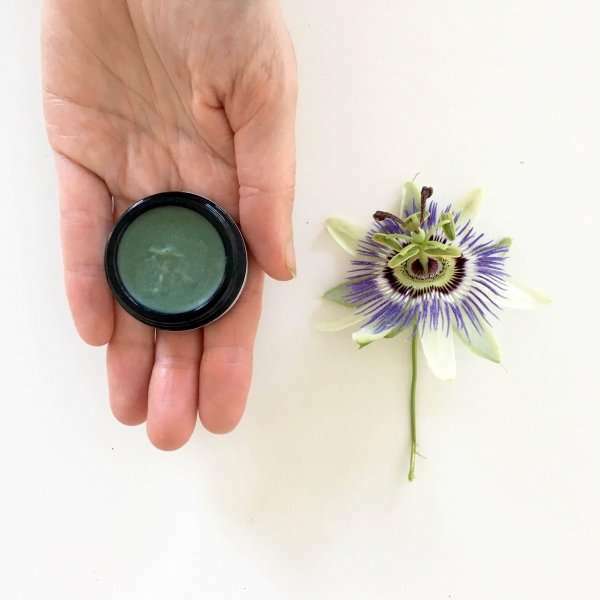 For the long, snowy winters we have here, a really good face and lip balm is crucial and yours are the best – and most luscious – I’ve ever found. I love the rich, instantly-soothing feel when I put some on – as well as the subtle, non-invasive scents. I notice that, unlike with other lip preparations I’ve used, my lips are LESS chapped with yours (which is the whole point!) not more. Perhaps it’s because there are no drying agents like olive oil or castor oil in your products. And they don’t have that gummy after-effect that some lip balms leave on your lips. I love, love, love your new Samba face balm! I was putting on some Samba last night and it smelled so good, I wanted to eat my own face – Iol . Yum – whatever is in that little pot, it’s very enticing!